When it comes to building your email list, there’s no shortage of ways to do so. You can improve the content in your sign up form, create an irresistible incentive, and even split test different versions of your form to increase engagement. But even if your sign up form is amazing, you need website traffic to make it effective. By increasing traffic, you can increase the number of people who see your sign up form and subscribe to your email list. So what are some ways you can drive traffic to your website without breaking the bank? In this post, I’ll share six tactics you can try to get more people to your site. And the best part of all? They’re totally free! If you create quality content but need to get it in front of more people, syndication is a great way to build brand awareness and drive traffic. When you syndicate your content, you are allowing another site to post content you’ve already published on their own site. And when you do, you’re able to get your content (and your company) in front of new readers. On top of that, if you link back to your own blog or website content in your syndicated articles, you can drive relevant traffic back to your site. When considering syndication, be sure to thoroughly evaluate partners you create syndication deals with to understand their terms and how it will impact your search engine optimization. If a search engine notices duplicate content on the internet (like an original article and the syndicated version of it), it will rarely put both articles in search engine results. Instead, it will choose between the two articles. To receive the most website traffic, you want the search engine to rank your original article in search engine results rather than your syndication partner. There are a few ways to assure your original article is the one search engines rank, like using a rel=canonical tag, not indexing the syndicated article and linking back to your original article in the syndicated article. If you’re ready to try syndication, you can start with sites like Medium, Business2Community, Apple News, and Social Media Today. Pro tip: If you get 200 green hearts on your Medium article in 24 hours, you may get listed on the homepage of Medium and in their Daily Digest emails – which means even more traffic for you! For tips on getting more hearts on your Medium article, check out these Medium optimization tips. Contrary to popular belief, RSS is not dead! In fact, in 2013, Feedly gained 12 million users after Google stopped providing their popular feed reader. RSS feeds can increase your blog traffic by allowing you to more easily share your blog content with other sites. If you’re syndicating your content, your RSS feed can automatically share articles with syndication partners, which can save you the work of manually submitting. You can also submit your RSS feed to Alltop, a site that lists the top five blog posts from popular blogs in hundreds of topics. To do so, sign up for an Alltop account and submit your RSS feed for consideration. Pro tip: You can use your RSS feed to automatically send newsletters to your email subscribers. While Facebook, Twitter and Pinterest often dominate businesses’ attention, LinkedIn is a powerful, yet often underutilized, social channel. LinkedIn has become a prime destination for thought-leadership and shareable content – despite the fact that the social platform has been criticized for their high advertising costs. Within the platform, there are two places where you can publish your content: LinkedIn Pulse and Slideshare. LinkedIn Pulse, where you can publish articles on LinkedIn, has over one million publishers and over three million long-form posts. Additionally, Slideshare (which is owned by LinkedIn), a site for publishing your presentations, is one of the top 100 most-visited sites in the world with over 70 million unique users and 18 million uploads. I encourage you to use these platforms to align yourself to niche topic areas to develop your expertise and personal brand awareness. Link back to articles on your website throughout your posts or slides to drive traffic back to your website. Pro tip: Beyond driving traffic to your site, LinkedIn even gives you the option to capture leads in your Slideshare presentation. Having a presence in online communities gives you a great opportunity to develop your brand and your expertise – and as you do, you’ll naturally begin to raise interest in your business and increase traffic to your website. In Thinkific’s #WeOnline summit, Dana Malstaff, author of Boss Mom, discussed how she used community participation as a way of building her business. Throughout the presentation, she emphasized that you should give generously to other people’s audiences in order to be authentic and build trust. To accomplish this, share your knowledge and expertise with the communities you reach out to. This will help you develop deep relationships with those communities and bring people back to your site when they’re looking for more useful information. There are numerous ways to increase your online presence, like: commenting on blogs and in forums, answering questions on Quora, talking in subreddits, guest blogging, or even participating in Facebook and LinkedIn groups. Building a presence in communities will not only develop brand awareness for you, but it will also give you the opportunity to connect with like-minded individuals and even people you can develop partnerships with. Pro tip: When participating in LinkedIn groups, make sure to follow the group rules. While some LinkedIn groups allow you to link back to your website in certain situations, others don’t allow this at all. One of the most important tactics you can use to drive traffic and conversions is to leverage relationships with other companies and influencers. By getting your brand in front of new audiences, you open up the door to new traffic to your site. If you’ve already developed these relationships – that’s great! If not, don’t be afraid to reach out to new people to start forming mutually beneficial partnerships. Before reaching out, write down a list of opportunities that you can bring to the table. Do you have a large social following? Do you have a loyal and engaged subscriber base? Are you great at public speaking? Once you’ve established a partnership, you can explore opportunities to work on projects together that will get you in front of their audience. Webinars, twitter chats, and exclusive online education series are great ways to create experiences that will benefit everyone. For example, we partnered with AddThis for a webinar on email list building. Not only were we able to share the expertise of both companies with our webinar audience, we also had more webinar attendees since we invited both of our audiences to the webinar. Pro tip: Don’t know where to start finding partners that will work with you? Review your referral traffic in Google Analytics to find sites that are already sending traffic to you. If they’re already a fan of your brand, they’re more likely to work with you. While Facebook and Twitter are great for bringing your social audience back to your website, email marketing may be even more effective. One of the reasons email drives conversions is its ability to boost website traffic. By sending your email subscribers emails with links back to your blog and website, you encourage them to visit your site and learn more about your company. For example, to regularly encourage your email subscribers to visit your blog, you could send a weekly or monthly email sharing your latest blog content. Our weekly blog digest emails share our top blog content from the past week and increase traffic to our blog. But what do you write in these emails? We can help with that. 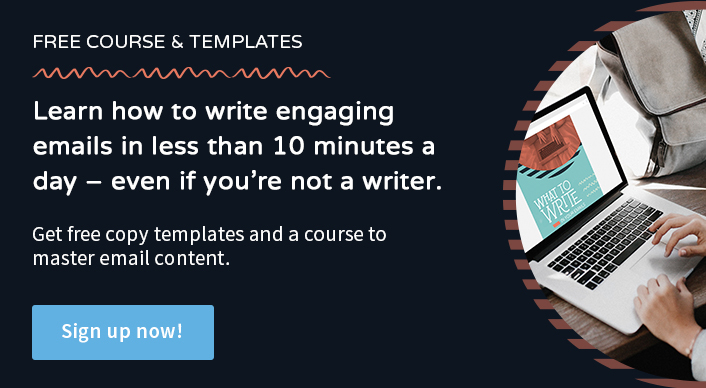 Take our What to Write in Your Emails course and get 45+ fill-in-the-blank email templates and a detailed guide! While these are only some of the many ways you can drive more traffic to your website, I encourage you to pick one to focus on as you get started. You never know what might work best! I also recommend checking out FirstSiteGuide’s 99+ Best Blogging Tools and Resources. They not only compiled the premier blogging tools for SEO, but also the leading sites and businesses for email marketing, photos, web design, and social media. What traffic-driving channel is your secret to success? I’d love to hear about it in the comments below! Isn’t that practice duplicate content? Can you explain in more detail? Yes, syndicating content is a form of duplication, which is why it is very important to review the syndication terms with the partner you are working with. We reference canonical tags in the article. Canonical tags allow you to tell Google where the article was originally published and point back to it as the main article that should receive the “SEO juice.” Typically, you would use this as a syndication tactic for close partnerships that you have. For larger partnerships, like Yahoo for example, you may have to sacrifice your SEO value for the amount of traffic you’re going to get. Google is getting smarter about identifying the original publisher for duplicate content based on publication dates, but that’s not a guarantee. Another tactic I would recommend when syndicating is to make sure there is a line in the article that states “the content was originally published by …” and includes the URL pointing back to your website. In some cases, you can have your branding on the article as well. Here’s a great example of a syndication partnership between Yahoo and TVLine. Best advice is to carefully review the terms of syndication partnerships before moving forward – in some cases it is ok to lose organic value if the return on traffic is greater than you think your own organic traffic would be (which typically happens when the reputation and domain authority of the syndication partner is much higher than yours). Thank you for tips! The example about duplicate content in comments is perfect! Thank you Rebecca for this very informative article, it’s very helpful. I will try using your tips. I hope they will work on my site. Medium is great for driving massive traffic to blog. Thanks for the tips. Thanks for sharing this informative blog. Thsi blog is very useful for everyone. keep it on.